Patriots-Chiefs AFC Championship, Key Matchups, Who Has the Razor’s Edge? The New England Patriots travel to Kansas City on Sunday night to take on the Chiefs in the AFC Championship Game, the winner of which goes on to Atlanta to the Super Bowl. The Patriots are advancing to their eighth straight AFC title game, an NFL record. With a win, they’ll also become the third team to appear in three straight Super Bowls. This week’s game will be broadcast by CBS and can be seen locally on WBZ-TV Channel 4. Jim Nantz will handle play-by-play duties with Tony Romo as the color analyst. Tracy Wolfson, Evan Washburn, and Jay Feely will work from the sidelines. The game will also be aired on the Patriots flagship radio station 98.5 The Sports Hub with Bob Socci and Scott Zolak on the call, produced by Marc Capello. The Patriots (12-5) dominated the LA Chargers 41-28. Sony Michel ran for 129 yards and three touchdowns, Tom Brady completed 34-44 for 343 yards and a score, Julian Edelman caught nine passes for 151 yards and James White caught 15 passes as the offense rolled. The Chiefs (13-4) beat the Indianapolis Colts 31-13 on a snowy Saturday afternoon. The Chiefs defense played their best game of the year holding the Colts to just 13 points while the offense ran for four scores on the ground. Damien Williams ran for 129 yards on 25 carries and a score. Patrick Mahomes completed 27-41 passes for 278 yards. The Patriots and the Chiefs are meeting for the 37th time including the playoffs in their history since the days of the old AFL when they would meet twice a year. Kansas City holds the overall lead 18-15-3. The Chiefs hold an 11-3-1 advantage in games played in Kansas City and a 5-1 record at Arrowhead Stadium. The Patriots won the last meeting between the two teams 43-40 on a Week 6 Sunday Night Football matchup. The Patriots running game has been a strength of the team down the stretch. Opposing defenses can’t just pin their ears back and rush Tom Brady as they’ve been able to run and run effectively with Sony Michel. In the first meeting, Michel ran for 106 of the Patriots 173 yards on the ground. Rex Burkhead, James White, and FB James Develin will all contribute on the ground as well. The Pats were 5th (127.3 yards per game) on the ground this season. The Chiefs defense was pretty awful against the run this season, allowing 132.1 yards (27th) on the ground. Last week, however, they were aggressive and took control of the line of scrimmage and kept the Colts at bay. Chris Jones had a very big game for them. Look for the Patriots to try to control the line of scrimmage, much like they did last week against a much better defense. However, this week the Chiefs are at home, with the deafening crowd noise, they’ll be able to time the snaps and get a very quick jump off. Michel and the ground game will be key on keeping the balance they need to keep the offense moving. They controlled the line last week and in the first meeting but this one will be tougher. The Jet sweeps weren’t a big factor the first time, but may very well be on Sunday night, taking advantage of the linemen pushing up the field. The Patriots passing game last week took advantage of the Chargers zone defense and Brady shredded them for 343 yards. Brady passed for 340 yards in the first meeting on throwing just 34 passes. The Patriots had the 8th best passing game (266.1 yards per game) in the league in 2018. The Chiefs pass defense was worse than their run defense in the regular season allowing 273.4 yards per game (31st in the NFL) What they lived off of was their pass rush which is excellent. Chris Jones, Justin Houston, and Dee Ford, can not only get after the opposing quarterback but knock down passes as well. Their secondary should have Eric Berry back and they’ve played much better with him than without. Look for Defensive Coordinator Bob Sutton to try to jam the middle of the field and contest all of the short to intermediate throwing areas that Brady thrives in. If they force him to hold onto the ball a bit longer, it will allow their pass rush to get home. The Patriots will try to move Edelman around to create some space on the outside, while trying to clear out the flat for James White to work in the passing game. Kansas City allowed the 5th most passing yardage to running backs this season. Brady will look to attack the middle of the field first. Gronkowski hurt the Chiefs with two big pass plays by getting the one-on-one matchups when they were there. That will definitely be in play if it becomes available to them. Pass protection is everything in this game for the Patriots, regardless of the running game, it is still a complimentary game and they remain a passing team first and foremost. Key matchup here is LT Trent Brown against Chris Jones in both the running and passing games. With crowd noise and not being able to mix up their snaps, the Chiefs will look to tee off. Flashback to Pittsburgh, the OL can’t shoot itself in the foot again with double-digit false starts again. The Chiefs lost their workhorse in Kareem Hunt but have gotten nearly identical production in the running game from Damien Williams. He gashed the Colts for 129 yards on 25 carries last week. KC had the 16th best running game in the league, averaging 115.9 yards per game. Kansas City likes to mix in the jet sweep and with the explosive Tyreek Hill, he blew thru the Indy defense for a 36-yard touchdown last week. The Chiefs rushed for 94 yards in the first meeting with Hunt getting 80 of those and averaging 5.5-yards per rush. The Patriots run defense has really been trending up the past three games. Last week against Melvin Gordon and the Chargers, they allowed just 19 yards on 10 carries.The defensive line and linebackers have been much, much better. On the season they allowed 112.7 yards on the ground (11th in the league). Andy Reid has gotten pass-happy in big games before, will he have the patience to stick with his running game on Sunday? I expect the Patriots will go with a lighter front for much of this one and there should be room to run the ball. The Chiefs passing game was positively electric this season. Mahomes threw for 50 TDs and they were third in yards this season with 309.3. But everything goes thru Hill, the small but incredibly fast wide receiver who, if he gets the slightest edge outside is gone. That happened in the first meeting, he got a step on one of the Patriots fastest defenders in Duron Harmon and he blew by him like he was a turnstile at the airport. Mahomes also has Travis Kelce who caught over 100 passes this year, Sammy Watkins, Chris Conley, Williams, Specer Ware, and Kelvin Benjamin, who was a healthy scratch last week against the Colts. The Patriots’ secondary play has improved over the course of the season. Stephon Gilmore had an All-Pro type of season and rookie J.C. Jackson an UDFA from Maryland has come on and played terrific down the stretch. The front seven has gotten plenty of QB pressure but that hasn’t translated into many sacks. Look for the Reid to run those RPOs (run/pass option) plays that gave New England fits last season. That allows Kelce to get quick separation at the line. It will be interesting to see how the Patriots approach covering Hill. While we fully expect him to be doubled with help over the top, who will draw him? The Patriots will probably get Gilmore on him with safety help over the top. We expect them to chip on Kelce at the line as well, to try to throw off their timing. The Patriots have a solid group of specialists with Kicker Stephen Gostkowski, P Ryan Allen, and returners with Edelman and Cordarrelle Patterson returning punts and kickoffs. The coverage units have been much better when the team added veterans Albert McClellan and Ramon Humber after Thanksgiving. The Chiefs have kicker Harrison Butker and the excellent Dustin Colquitt in their kicking game. They also have the dangerous Hill and Tremon Smith who had a 97-yard return in the first meeting. This time however, we’re going with experience. Edelman has been at his best in big games and Patterson is as dangerous a kick returner as there is in the NFL. Look for the Patriots to get after a punt this week. This is shaping up to be an instant classic. The first meeting went right down to the wire with the score tied at 40, Brady hit Gronkowski with a big 42-yard pass play down the field and Gostkowski kicked a FG with three seconds left. We expect another really close game, perhaps not quite as high scoring as the first matchup. The Chiefs at home have been ridiculously fast starters, they’ve outscored opponents at home in the first quarter by a huge margin. Last week against the Colts was no exception. They bolted out to a 14-0 lead and never looked back. The Patriots have been notoriously slow starters this season, especially on the road. That would be curtains for any chances of winning if that happens. They have to be on top of their game from the opening kickoff. Reid scripts his first 20 plays or so, so we’d expect the Chiefs to throw some wrinkles at them right off the bat. Expect a very aggressive start on both sides of the ball to get the crowd even more into it. Last week the Patriots got off to the best start in the history of the team in the playoffs last week and that propelled them to an easy win over the Chargers. They need that type of start again. Offensively, the Patriots have to keep the Chiefs defense off-balance, Third and long situations will unleash the KC pass rush and they have to limit those type of situations. The Pats rolled up 500 yards of offense last time, by doing just that. Running effectively, and spreading the ball around. Defensively, they won’t pin their ears back and come after Mahomes like they did to Rivers because if he escapes (and frequently does), then a big play is sure to follow. Mix up coverages, I wouldn’t be surprised to see some split coverages by the secondary. The key is contain him and keep him in the pocket. When plays break down and the Chiefs play backyard football, big plays will result. The Patriots will want to try to slow the pace down this week, a track meet will really favor the Chiefs at home. They want to grind them down with slow, methodical drives that eat the clock. The Patriots special teams have been much better down the stretch and I expect some big plays to happen this week. 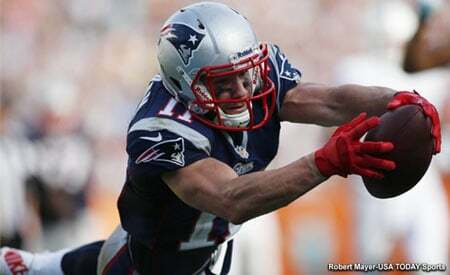 Patterson and Edelman will have to kick it up a notch but a STs score or big play will go a long way this week. The Red Zone will of course, be of paramount importance this week. Kicking field goals in KC is a recipe for losing. They have to score like last week. In the first half the Pats were 5-5 in the red area. On the flip side, they have to manufacture some stops and force the Chiefs to settle for some threes or get a turnover or two. When the Chiefs beat the Colts, I immediately pegged this as a loss. I thought the Pats would win a tough, close game at home against the Chargers and then go on the road and lose to KC. 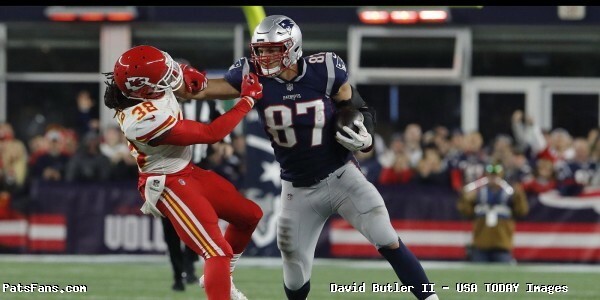 This entry was posted in 2018 Patriots playoffs, NFL Commentary, NFL News, Patriots Commentary, Patriots Film Room, Patriots News and tagged Andy Reid, Bill Belichick, Chris Jones, Damien Williams, Dee Ford, Devin McCourty, Dont'a Hightower, Julian Edelman, Justin Houston, Kansas City Chiefs, New England Patriots, Patrick Mahomes, Rex Burkhead, Rob Gronkowski, Sony Michel, Stephon Gilmore, Tom Brady, Travis Kelce, Trey Flowers, Tyreek Hill on January 18, 2019 by Steve Balestrieri.